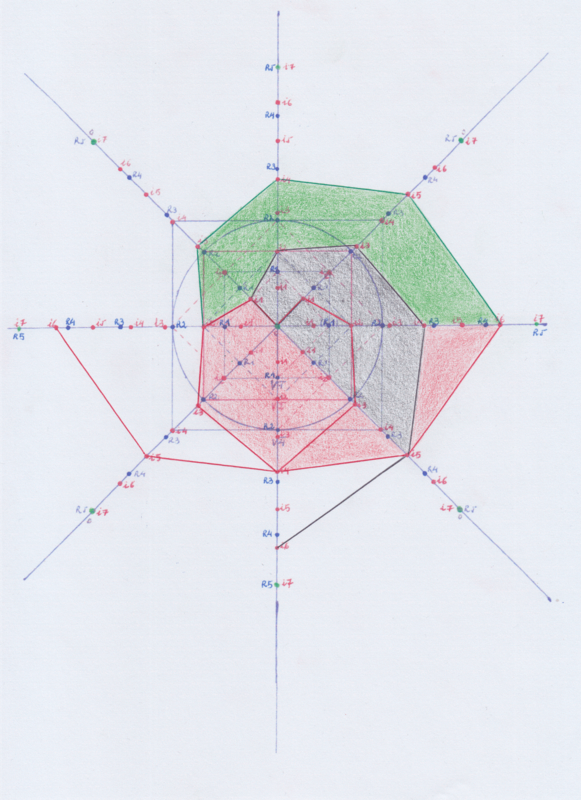 Solving Quintic and Higher Functions in Terms of Radicals by Means of their Mirror Symmetric Counter-Functions. I’ve edited this article to make it clearer, updating it with a part of the post titled “To Galois or not to Galois”. Below, I kept the previous versions of the post. 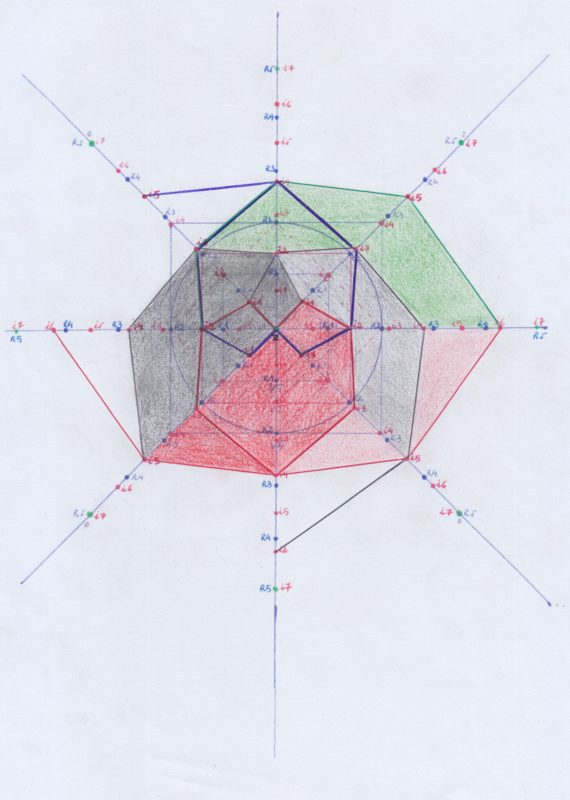 I’ve drawn a right handed 4th degree “function” starting from the zero point (at the center of the circumference) and following the red points i1, i2, i3, i4 points, and then I drawn its mirror symmetric left handed counter-function. 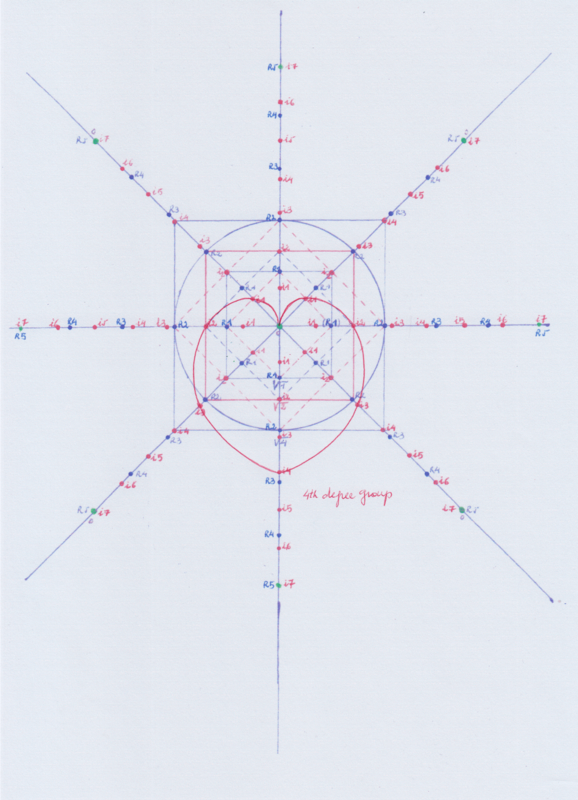 They both converge at the 4th degree point i4, creating a finite field or “group” of 4th degree (the small red heart in the first attached picture). If we extend those + 4th and – 4th functions towards their 5th degree, the red point i5, we’ll see that the mirror symmetric functions will diverge. So, the 4th is the maximum degree we can use when it comes to converging mirror symmetric functions to create their closed groups. One of the analogies that is used to explain the insolvability of quintic and higher equations is to imagine that we enter in a building with infinite floors and that we are able to ascend to the next larger upper floors because each floor has each own stair. But when we arrive to the fourth floor, we find the stair to go the fifth floor is missing. We cannot go up to the next floors then. And so, it does not matter if the seventh floor has or it has not a stair because we will not be able to arrive there. On the above geometric figure, the stair of the 4th floor to go up to next floor is broken because it’s not just about having only one stair, it’s about having two stairs on each floor, or two mirror symmetric sides of a same double stair that should converge at the fifth stage to create the fifth floor itself. Each side of the double stair starts from a different location of the 4th floor. And the building has the form of a spiral tower because the next floor will be rotated with respect to the 4th floor. Actually there will be al least two 5th floors rotated towards opposite sides. But my dears ones, geometry is not a metaphorical approximation to the abstract mathematics. Numbers are not purely abstract entities, they all represent a distribution; any distribution implies a space; and any space implicates symmetry or asymmetry. Anyway, to be able to make converging the two extensions of the 4th functions, we would need to twist them in such a way that the symmetry will be broken. And that’s what Galois demonstrated with his theory. 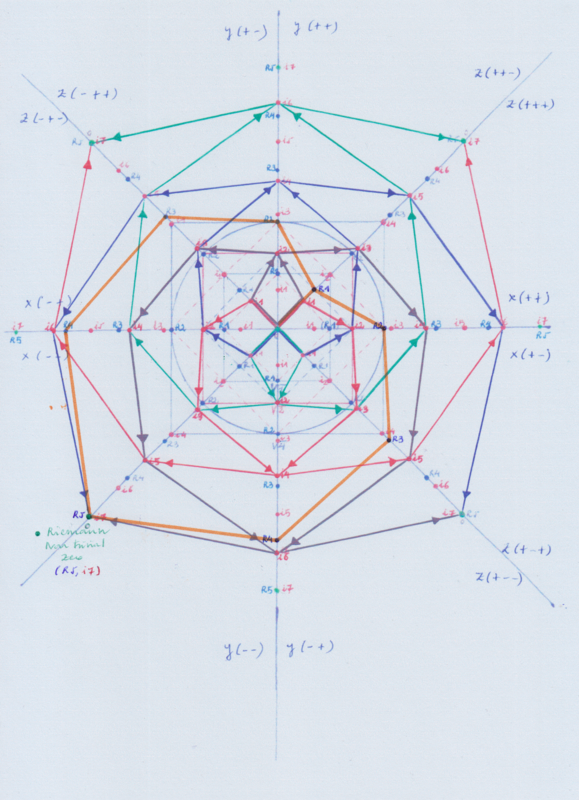 That the symmetry or the structure of the “Galois group” resultant for the equations of fifth or higher degree becomes so complicated that it is not possible to get a solution with using simple mathematical operations. But I think we can also create another 4+n degree function that will converge, acting as its counter-function, with our extended 4+n function by using only 4 degrees and without changing the original symmetry, or changing it slightly. 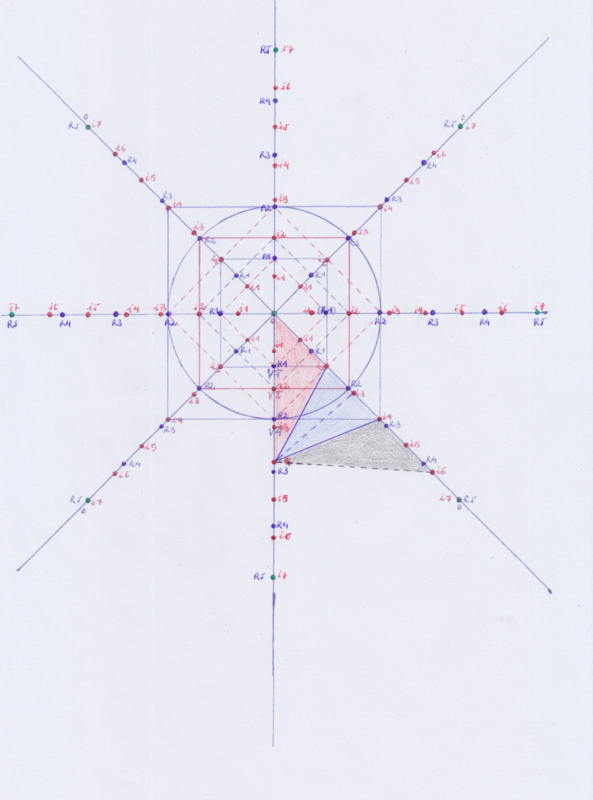 To do that, we will need to build the new mirror symmetric 4+n counter function starting it from the n degree point of the precedent 4th degree function instead of starting it from the Zero point (Functions of degree 4th and below start from the zero point. 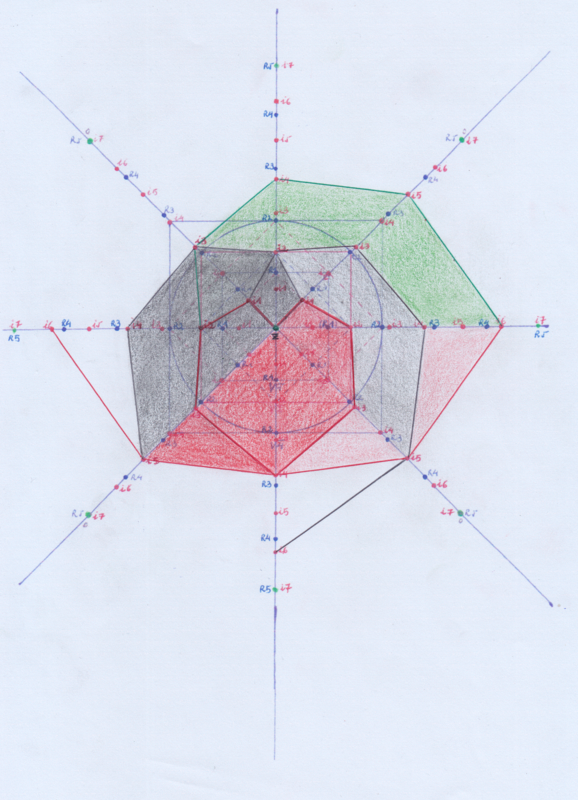 I did not represent the functions of degree 1,2,3 on the picture as they are not problematic, but they would be placed inside of the 4th degree field). 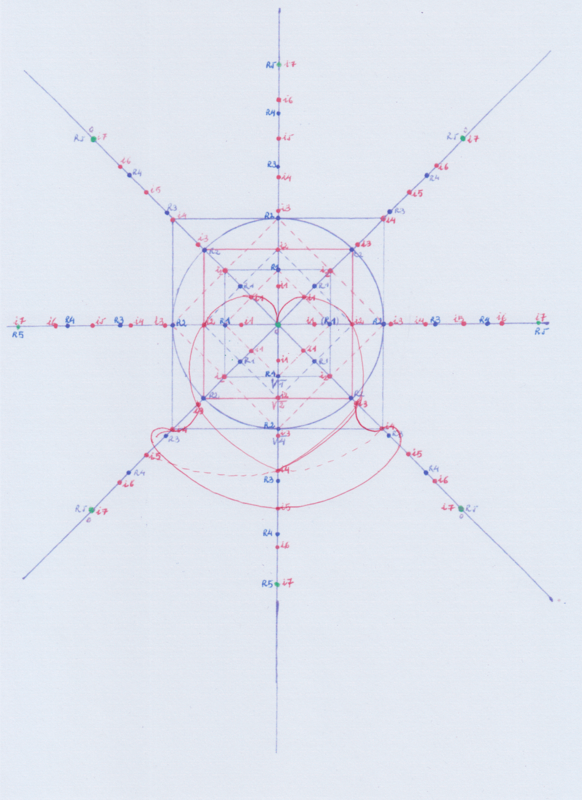 As a result, the 4th+n degree field will be built as a transformed and rotated extension of the 4th degree field. 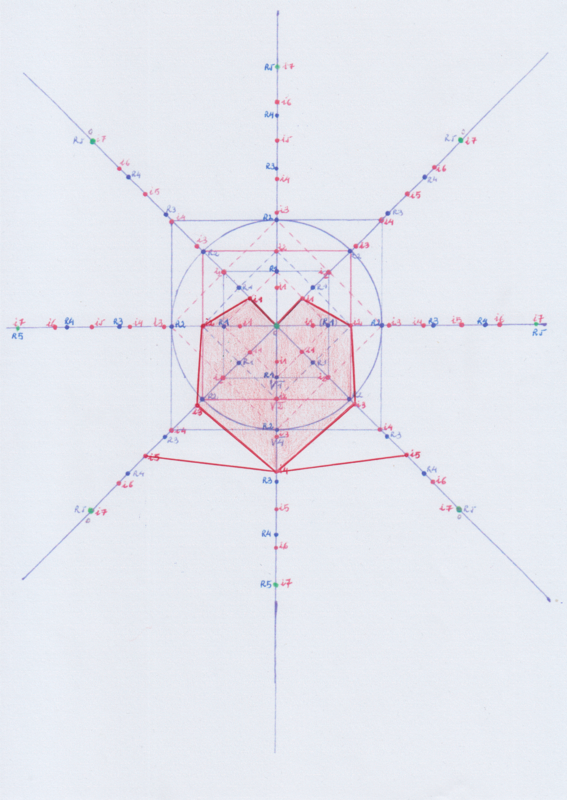 The red and black colored “heart” represent the field of degree 5th; its right and left perimeters are its quintic functions, the left negative one created as a positive extension of the quartic negative function, and the right positive one created as a positive extension of the negative function of degree 1. 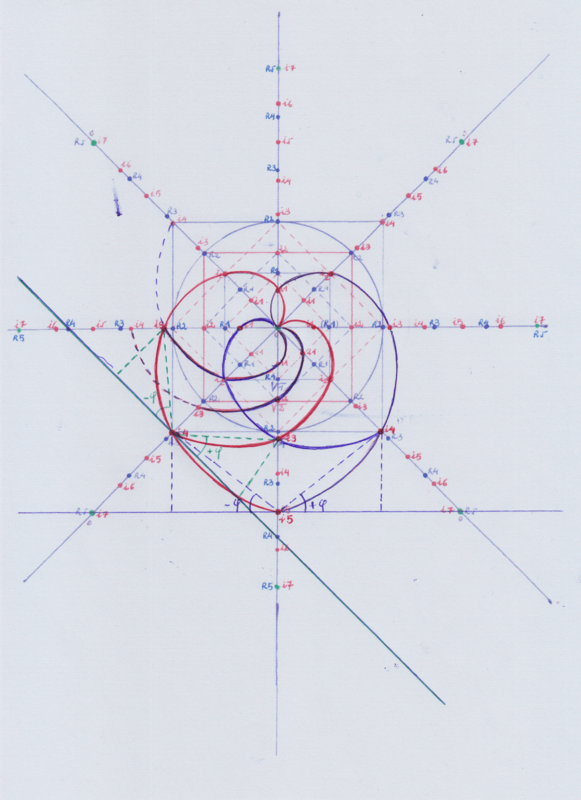 In this way, we can build the next 4+n degree converging functions and counter functions by extending other functions of lower degree, without changing the original symmetry, in this rotational way. To do that, we will need to build the new mirror symmetric 4+n counter function starting it from the n degree point of the precedent function instead of starting it from the Zero point. (Functions of degree 4th and below start from the zero point). As a result, the 4th+n degree field will be built as a transformed and rotated extension of the 4th degree field. The mirror symmetric functions and the closed fields they build will cancel to each other if we subtract them, and as they are perfectly opposite, they will give as result zero. 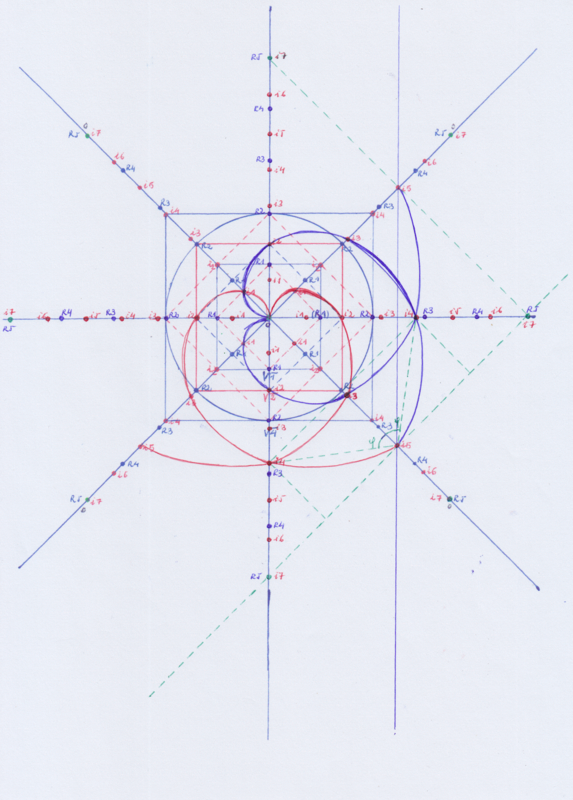 The 4th degree field F4 will be created by a + 4th degree function F(A) composed by aˆ+- 0, aˆ1, aˆ2, aˆ3, aˆ+- 4, and by its mirror symmetric counter function F(-A) composed by aˆ+- 0, aˆ-1, aˆ-2, aˆ-3, aˆ+- 4. We can extend F(A) and F(-A) to their 5th degree points in this way: EF(A)= aˆ+- 0, aˆ1, aˆ2, aˆ3, aˆ+- 4, aˆ-5 and EF(-A) = aˆ+- 0, aˆ1, aˆ2, aˆ3, aˆ+- 4, aˆ5, but that extension will not create the 5th degree field F5 because the convergence of the counter functions already occurred at a+ -4 F(A), F(-A) . 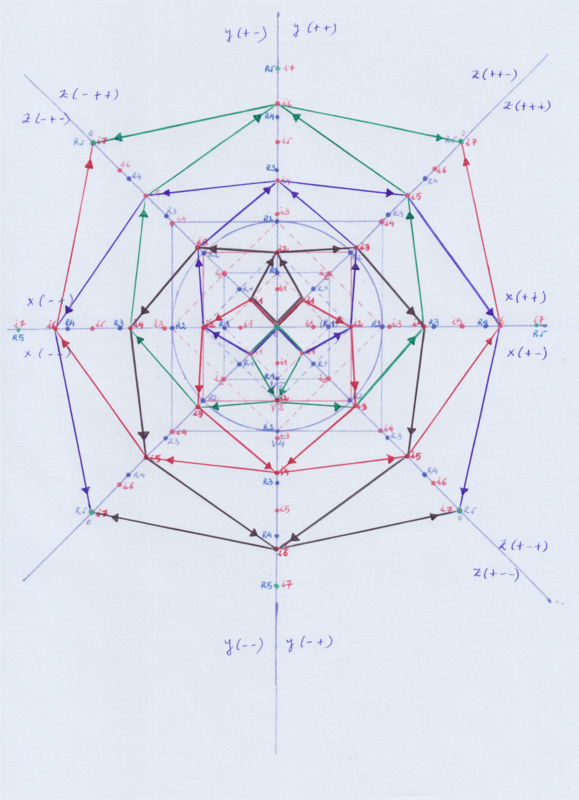 By doing that, as we are following the same intervals that carry the same kind of symmetry (through the red points represented on the diagrams as i1,i2,i3… in) in all our functions from the degree 1 to the degree n, although we get a 5th degree function from the point of view of the extended 4th degree field, from the point of view of the 5th degree field we only have used 4 degrees because the 4th degree point a -1 F(-A) is actually the + – 0 point of the 5th degree function F(B) which is the mirror symmetric counter function of the 4th degree function extended to its 5th degree EF(-A), becoming a F(-B) function that forms the left handed side of the F5 field. In that sense, the point degree bˆ1 F(B) is the mirror symmetric element of aˆ-2 (F-A), and so on. As a result, the 5th degree field F5 appears as a rotated extension of the 4th degree field F4. (The mentioned functions would be the perimeter of the fields they create). 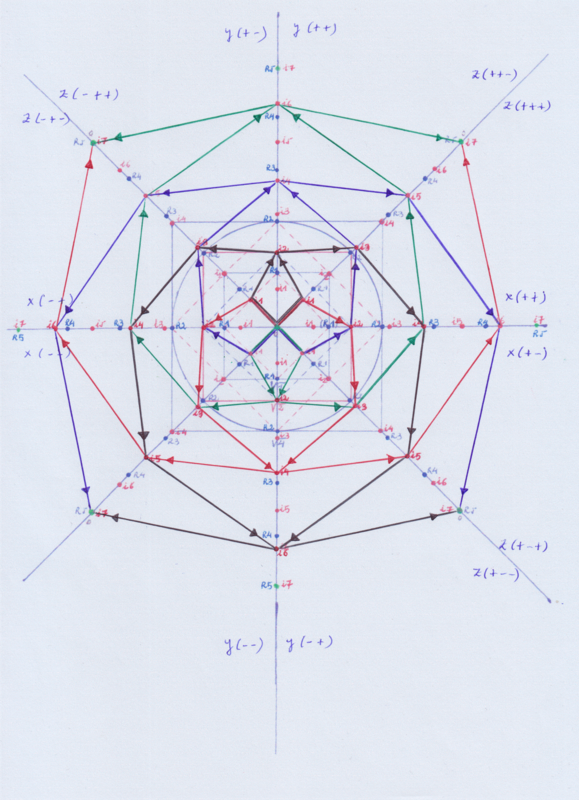 With respect to the intervals I used represented on the picture as the red i1… i7 and the blue R1… R5, I took them from the segment measured through the Z coordinate from the center of the circumference to the center of symmetry (their central point) of the squares 0,25 and 0,50. It can be seen that the squares 0,25, 1 and 4 follow the same interval repeated n times, while the squares 0,50 and 2 follow another kind of interval. Those different and directly incomparable kinds of intervals of symmetry appear when we displace the Y coordinate towards the Z position, or when we displace the Z coordinate towards its X position. 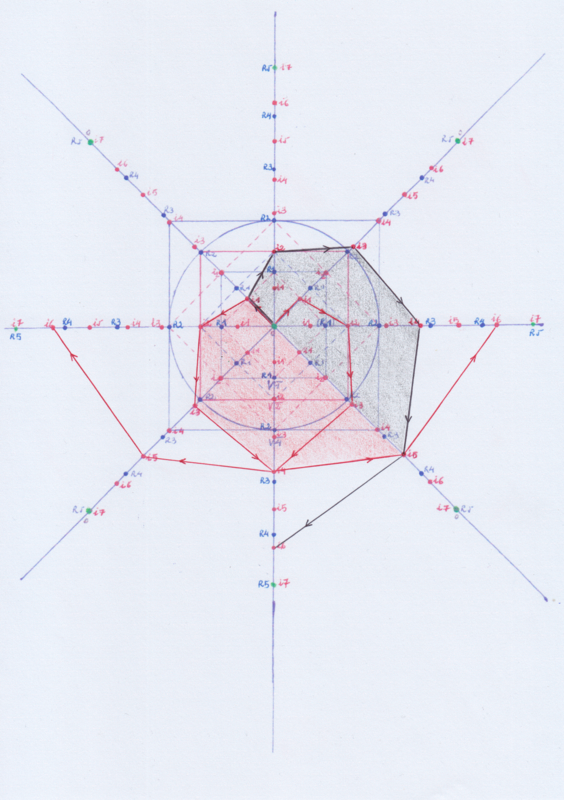 To use the Z coordinate at the same time we use the quadratic coordinates XY, implies that we are introducing a new plane, the irrational one, on our working space and we displace it from our rational and anchored XY plane. The effect is the same as if we were expanding the space (from Y to Z), increasing the length of our primary (and “Rational”) referential segment 1 that will become an irrational segment, and we were contracting it (from Z to X) again. Those rational and irrational intervals will converge at the i7 and R5 points where the 7th degree and 5th degree functions will converge with their counter functions. I think those converging points will represent non-trivial zeros of the Riemann Z function because they will be complex zeros formed by a rational and an irrational part. I’m going to add today several other pictures that I think could clarify the post. To fix the broken symmetry of the 5th group it will be necessary to build it from two 4th groups, a + and a – 4th group, that would be “complex conjugate” groups. So the 5th group that respects the symmetry would be an extension of two complex conjugate group (it’s said that when two groups are inside of another larger group, this larger group is an extension of the smaller groups). If we think as Galois said that 5th functions cannot be solved by using simple mathematical operations because of the complicated symmetry of their structure, I think it’s reasonable to guess that it will be possible to solve them by radicals if we are able to fix the broken symmetry of the 5th group. Anyway, I think it could be sayd the 5th degree field is a extension field of two conjugate Galois groups, and that the symmetry is respeccted. 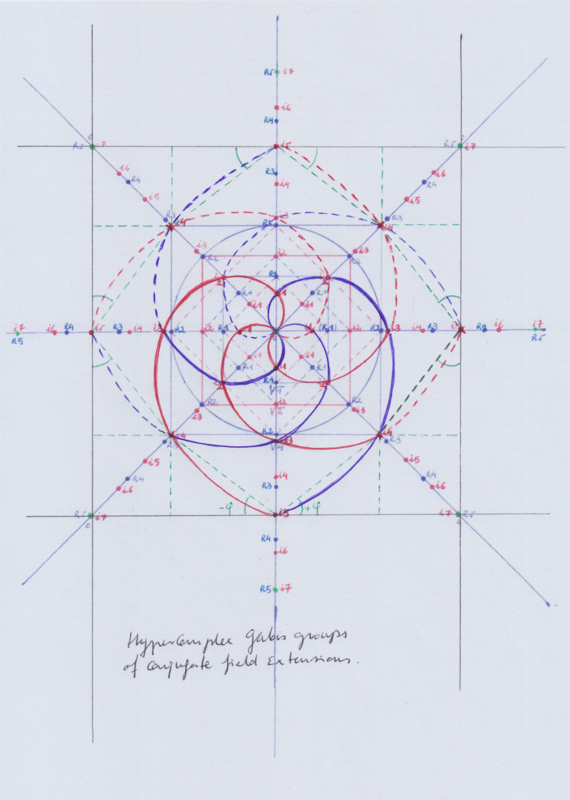 On the other hand, the Galois’ groups of symmetry were also used to solve another old question related to the posibility or impossibility of finding out a general way of dividing any angle in three equal parts, in a simple way just with a compass and a straightedge. That problem is known as the “Angle trisection”. It was Pierre Wantzel who, on the base of Galois theory, demonstrated at the XIX centrury that it was not possible to find that general solution to the trisection using simple tools. Yo can take a look at his article here: Wantzel demostration. In this sense I think that if the problem of the trisection is also related to the breake of symmetry, maybe there is a way to fix the broken symmetry in a similar way I did above for the 5th and higher functions. The below picture represents a case were the trisection can be performed easily. But it would not happen the same if the angle were built on i5,i6 (instead of i4,i6). I will keep thinking about this question.